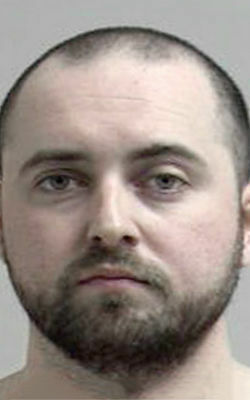 A Rock County sheriff’s deputy has been placed on administrative leave after being arrested on domestic violence charges, the sheriff’s office announced Thursday. Janesville police arrested Deputy Keegan Kelly, 26, on Wednesday on a charge of disorderly conduct/domestic violence, according to a sheriff’s office news release. And Lake Delton police have arrested Kelly on a charge of domestic violence strangulation, a felony, as well as charges of domestic violence battery and disorderly conduct, according to the release. Lake Delton officers came to Janesville as part of their investigation, and after Janesville arrested Kelly at the Janesville Police Department, Lake Delton took him to the Sauk County Jail, said Lt. Charles Aagaard of the Janesville police detectives. Aagaard said he expected Kelly would be formally charged and appear in court in Sauk County before he is charged in Rock County. Lake Delton Police Chief Daniel Hardman said he hoped his department's report would be sent to the Sauk County District Attorney's Office on Friday. The incidents happened while Kelly was off duty and involved “a female companion” who contacted Lake Delton police Tuesday, which started an investigation, according to the release. Aagaard said the woman is an adult, but he couldn't say much more about the open investigation. Hardman said Kelly and the woman are not married. Rock County Chief Deputy Barb Tillman placed Kelly on administrative leave with pay Wednesday, pending an internal investigation, said Rock County Human Resources Director Annette Mikula. Kelly was relieved of police authority and had his weapons and deputy sheriff commission card confiscated “pending the further outcome of both the criminal and internal investigations,” according to the release. “Once the criminal investigation is completed, a thorough employee-misconduct internal investigation will be conducted by the Rock County Sheriff’s Office,” the release states. “The unlawful misconduct allegations are extremely serious, and the sheriff’s office will take necessary steps to ensure that justice is served and that our highest standards for conduct are maintained by sheriff’s office employees,” the release states. The sheriff’s office will have no other comment “at this time” because the sheriff’s office is not conducting the criminal investigation, according to the release. Kelly was hired as a deputy Jan. 4, 2018, after working as a correctional officer at the Rock County Jail, according to a previous sheriff's office news release.